Motorola has unveiled its much-awaited Moto X smartphone. The Android-powered phone is the first Motorola smartphone created in collaboration with Google since the Internet titan completed its purchase of Motorola Mobility in May last year. Here's all you need to know about the Google's all-new phone Moto X. Another unusual feature of the Moto X, apart from the customization option, is that it's always listening for its owner's voice. When it hears the phrase, "Ok, Google Now..." followed by a command like "Call Bob" it will wake up from standby and execute the command, provided it understands it. Most smartphones offer voice control, but it's usually activated by pressing a button. Moto X comes with a 4.7-inch touch screen. It runs on a no-frills implementation of Google's Android operating system (Android 4.2.2). This is in contrast to the phones from Samsung and HTC, which put their own stamp on the software with various add-ons. The smartphone has a 10-megapixel camera at the back, and a 2-megapixel on front. It comes in 16 or 32GB memory options. There is no option to expand, however, Google is offering buyers 50GB storage free on Google Drive for two years. Moto X dimensions are height: 5.09 inch; width: 2.57 inch; depth: 0.41 inch. The smartphone measures 0.41 inch at its thickest point and weighs 130g. Moto X comes with a non-user replaceable battery. It offers a talk time of 13 hours, according to the manufacturer. Google Moto X runs on a 1.7 gigahertz dual-core Qualcomm Snapdragon S4 processor. 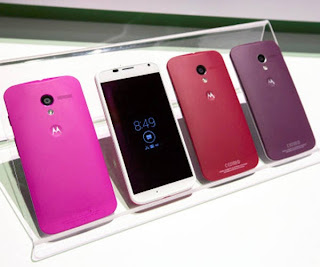 Motorola developed twin lower-powered chips to run alongside Qualcomm's Snapdragon S4 Pro main processor. The multi-chip system is reportedly designed to save battery life by letting the processor sleep while the lower-power chips work in the background. The Moto X is due for US release in late August. It will also launch in Canada and Latin America in the same month. The Moto X is going on sale at all four wireless carriers in the US — Verizon, AT&T, Sprint and T-Mobile. Moto X will have a starting price of $199 in the United States if bought along with a two-year service contract with a telecom service company. Initially, only AT&T will offer the customization option, but Google said it hopes to make it available across all carriers soon. The company will offer 18 different back covers ranging in colour from "spearmint" to "cabernet," a choice of black or white fronts and seven different metallic accents for details like the volume button. That makes for 252 possible style variations of the phone.